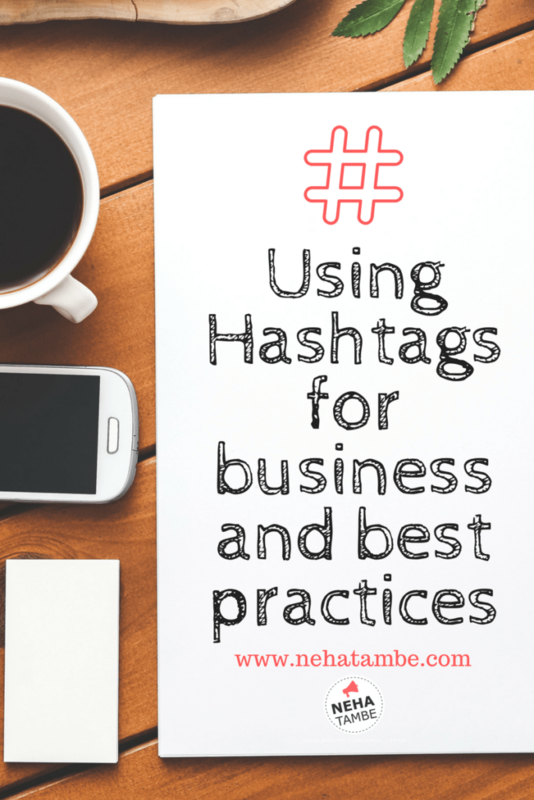 As a small business or personal brand, you might wonder how will hashtags help you? Hashtags are currently everywhere on the social network. These are one word or word combo prefixed by a #. They are not just some words with # to be stuffed in your text, if used correctly, they will help bring a lot of relevant traffic to your page and website. Hashtags were first introduced on Internet Relay Chats, a kind of live chat and messaging service. It really caught up with Twitter. It was introduced and used very well on Twitter and later it was extrapolated and experimented by almost all social networks. Though you are a small brand or a personal brand, you can leverage the hastags for your benefit. The hashtags that you use should be Brand Hashtags, Campaign Hashtags, Hashtags relevant to your product and industry and finally trending hashtags. Create a hashtag that is unique to your brand or tagline. Use this hashtag in every post that you put out on social media. The idea is to build a top of the mind recall about your brand. If the brand name is an acronym or something that is too long, you could even look at using the tagline. Tagline should be preferred second as apart from national brands, small brand taglines might not be associated with the brand. Another reason is that taglines are usually generic, so posts that are totally unrelated to your brand will also get grouped under your #hashtag. Campaigns and contests are run with a purpose. One to attract new customers and popularizing the brand. The quickest way to get conversations going around your brand is my having a campaign hashtag. These hashtags not only help in communicating with the audience that is participating faster, it also helps group all the buzz around the contest under one umbrella. Apart from these branding related hastags, everytime when you post, make use of the regular hashtags that revolve around your product or services. For eg If you are a baker use #bakedgoods or a digital marketer #digitalmarketer #onlinemarketer. These are not something that will distinguish you from others, but it will help pop-up when someone is searching for these products or services. These can be found on the left side of Twitter home page or on G+ home page. These trending topics are what is being discussed currently. Oreo is known to make great use of trending hashtags and topics. Check the current trending topic and see how you can use them in your communication. But remember to not stuff irrelevant hashtags just because they are trending. The best idea is to weave it through your communication. Apart from the trending hashtags, there are a few hashtags that are evergreen and are regularly repeated. For eg : #MotivationalMonday or #WednesdayWisdom etc. these are common and popular hashtags, which invariably trend on those days. Try using these hashtags. Remember to create content around it when you build your content plan. Hashtags can be time consuming and confusing when you are doing things on the go! However they are essential for a better reach, so how do you do this? Understand not every medium reacts the same way to hashtags. Know how much to use. For eg: Instagram lives on hashtags, however twitter has a character limit, so you need to include very relevant hashtags. As hashtags are highlighted, in the post, it becomes annoying to read something that is peppered with hashtags. Try and communicate what you want first and then use the generous dose of hashtags. Don’t use irrelevant hashtags, just because you want to increase reach. Your post will be ignored anyway, plus your brand might get a ‘spammer’ tag. Always ensure that you use hashtags related to your brand, campaign if applicable, product or service, how will it help and who will it help related hashtags. Check the related hashtag feature on instagram and twitter and use the popular or correct ones. Apart from this, there are a few sites that can help you find relevant hashtags. You can check your keywords in these sites to know which hashtags in your niche are currently popular. You can search for related hashtags by using a keyword. It will give you instagram specific keywords, keywords that are banned, keywords that are popular and can be used now and over time. It even gives you an analysis of the hashtags and their performance across networks. Hashtagify helps search for popular hashtags, it also offers popular hashtag’s for last month or week. Trendsmap is a unique tool that offers trends from all over the world. You can search based on your city or a particular handle and how people have been reacting to it. Tailwind is a social media management tool that helps share on Instagram and Pinterest. When you add photos for Instagram, it automatically suggests the most popular and relevant hashtags. Hashtags when used correctly can give your posts reach, branding and engagement. Ignoring them is a big mistake that most brands do. Spend some time to get organized and reap benefits of hashtags. I have multi niche blog. How can I use #tags to promote my blog ?